Did you know that, when everything else is equal, employers will opt to hire slender, physically fit job prospects rather than their weight-challenged peers? I mention this because, knowing how mightily Americans are struggling with obesity (courtesy of McDonald's and the various school lunch programs that still offer pizza and other sources of empty calories), I wanted to share an absolute revelation. It's called kangoo, and it's changed my life for the better. Like mountain climbing and stand-up comedy, though, I find it difficult to explain kangoo to someone who's never experienced it. But, I'll try. One performs kangoo by donning a specially-manufactured pair of ski boots that are supported by an impact protection system featuring two arc-shaped shells held together by a tension spring. The result is a bouncing platform that reduces the normal, pounding impact of running by up to 80 percent depending on the exercise. And, because the boots balance themselves naturally, one is constantly using every core and leg muscle to constantly stabilize the body. As a result, the muscles work in total harmony with one another (confused and tired yet?). - dance classes (which, since I was born with two left feet, I avoid like the plague). I've been alternating the latter two for well over two months now and the results have nothing short of amazing. – I was hooked faster than one can ingest a batch of crystal meth. The beauty of kangoo, aside from the way it re-sculpts one's body and burns hundreds, if not thousands, of calories, is that it forces you to stay in the moment or, as Friday’s guest columnist, Ruth Fishel, would say: practice mindfulness. As is the case with comedy and climbing, it is impossible to think of anything else but kangoo as you practice kangoo (that's because every step is critical AND your body is fighting to maintain its equilibrium). Mario tells me he's one of only five master trainers in the States who is fully certified to teach and train with kangoo. Here’s a recent ABC nightline segment that will do a much better job of showing you what I’ve been experiencing. Kangoo was invented in Europe for sport injury rehabilitation. In fact, kangoo’s impact reduction enables people with injuries to heal faster and still exercise without reinjuring themselves or further exacerbating their injury. It’s also a cellular workout. 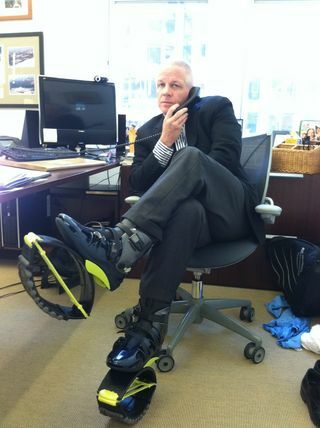 Every time one rebounds on the kangoo boots, it’s like 60 trillion cells doing a pushup! That’s a whole lot of tired cells. And, when the cells regenerate, they regenerate stronger than ever. I believe that’s a win-win-win-win. But, I‘m not positive. The bottom line? I can assure you that kangoo will melt pounds off your frame faster than you can say sauna. And, you'll emerge from the session with a kangoo high that lasts for the entire day. Hey, maybe Demi Moore should consider it as a solution to her nitrous oxide addiction? Thanks for the post, Deb. You obviously prodded me into trying kangoo, and, it’s positively addictive. That said, I find it interesting that, in only a few months, I’ve already surpassed you in terms of kangoo fitness and am now considered by Mario to be among the kangoo elite. Must be a tough pill for you to swallow. It’s great to see that you’re finally a Kangoo Konvert, Steve! I couldn’t agree more. I’ve been Kangooing for 1-1/2 years and I’m in much better shape now than when I was in my 20’s. It’s the best exercise…for your body and mind!